STRIVE is an after-school program that provides teens with sickle cell disease the mentoring, peer support, academic assistance, and disease management education they need to manage their condition effectively and realize their full potential. Teens with sickle cell disease (SCD), an incurable genetic disorder predominantly affecting African Americans and Latinos, are among the most vulnerable youth living in urban centers. Due to sometimes frequent or long hospital stays, teens with sickle cell disease often miss weeks of school, compromising academic achievement, disrupting social networks, and causing isolation. We offer an after-school program that helps overcome these issues through one-on-one academic tutoring, mentoring, peer support, disease management education, and medical self-advocacy training. 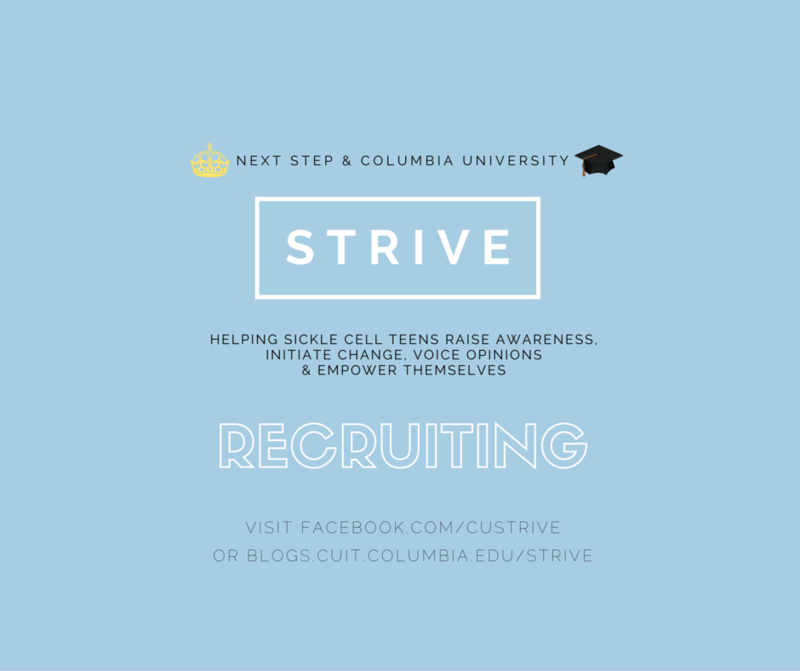 Columbia and Barnard volunteers in the STRIVE program serve as tutors and mentors for teens with SCD. Participants in the program come to Columbia University every Friday from 4-6pm (excluding university holidays). During the first hour, volunteers help participants with schoolwork, and during the second hour, volunteers teach interactive lessons relating to SCD. The tutoring component of STRIVE is essential, and if participants can benefit from additional tutoring outside the standard program time, that can be arranged as well. In addition to being a teaching resource, STRIVE is also a place for youth who have SCD to share their experiences and learn from each other. Some of this bonding occurs outside of standard programs through our great field trips to places like the Central Park Zoo, bowling alleys, Dave & Busters, and more! STRIVE is a small organization–we keep about a 1:1 ratio of participants:volunteers. Because of this, volunteers have an opportunity to take an active role in the teens’ growth, while the teens have the opportunity for personalized attention.